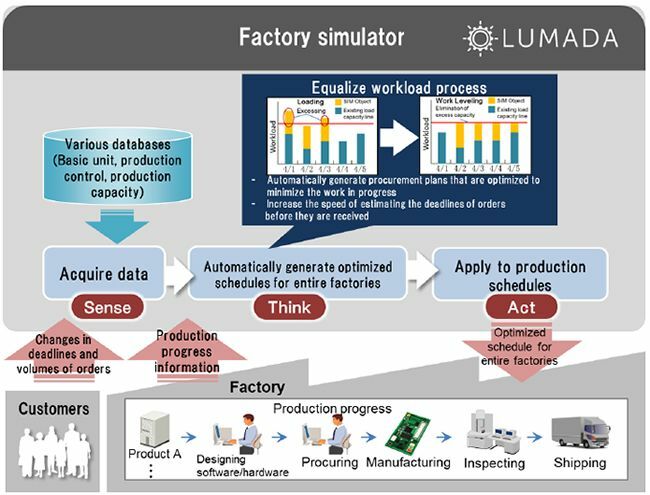 Hitachi launches the systems to automatically generate optimized production schedules and 3D work instructions as a solution core for the IoT platform "Lumada"
Tokyo, October 17, 2017 --- Hitachi, Ltd. (TSE:6501, Hitachi) today announced that as of November of 2017, the company will launch the "factory simulator" to automatically generate optimized production schedules for entire factories, and the "assembly navigation system" to automatically generate 3D work instructions based on 3D CAD data. These systems are made possible by using the IoT*1 to link a large variety of information. These systems strengthen the lineup of the industrial solution cores of the IoT platform "Lumada", and it will follow the "progress and operation monitoring system" and the "kaizen activity (work improvement) support system", which were launched by Hitachi in July of this year. By introducing these new systems, the production lead times in high-mix low-volume of manufacturing plants can be shortened. In recent years, due to escalations in global competition and diversifications of customer needs in the manufacturing industry, customers have been looking for mass customization that offers the same level of high quality afforded by high-volume production, even from manufacturing plants that operate on high-mix low-volume production. In manufacturing floors, production schedules are repeatedly changed whenever there are changes such as to deadlines and the volume of orders. The problem lies in figuring out how to improve production by optimizing the entire series of processes, from receipt of an order to the design, procurement, manufacture, inspection, and shipment of the product. The technology introduced to Omika Works was used and commodified, and a large variety of information concerning production processes, such as information about customers and manufacturing floors, was aggregated. The result was the production of two systems. The first system, the factory simulator, automatically generates optimized, medium to long-term production schedules that take into account issues such as the production capabilities and workload of the entire facility, and sudden changes to deadlines and the volume of orders. The second system, the assembly navigation system, converts 3D CAD data to 3D work instructions, and automatically generates assembly instructions for products. This system automatically generates medium to long-term production schedules that look at the entire production process (from the receipt of an order to the design, procurement, manufacture, inspection, and shipment of the product) to take into account the specifications and deadline of the product, and the production capabilities and workload of the entire facility. As a result, production schedules are remade to conform to changes in items such as customer deadlines and the volume of orders, and estimating the deadlines of orders before it is received becomes easy. The amount of time required by production managers for planning and procurement can be drastically reduced, and inventory assets can be scaled down by reducing loss costs and work-in-progress inventories. Specifically, information about the production progress of each process in the facility, and information related to customer deadlines and the volume of orders, is collected. Based on this information and information such as production schedules for other products, the production capabilities of each process, and workloads, unique simulations (loading3 / work leveling4 ) using the basic unit*5 are performed to allow production schedules for which the workload for each process is leveled to be automatically generated. In addition, by remaking production schedules to conform to the status of the production progress, procurement plans that are optimized to minimize the work in progress in the facility can be automatically generated. 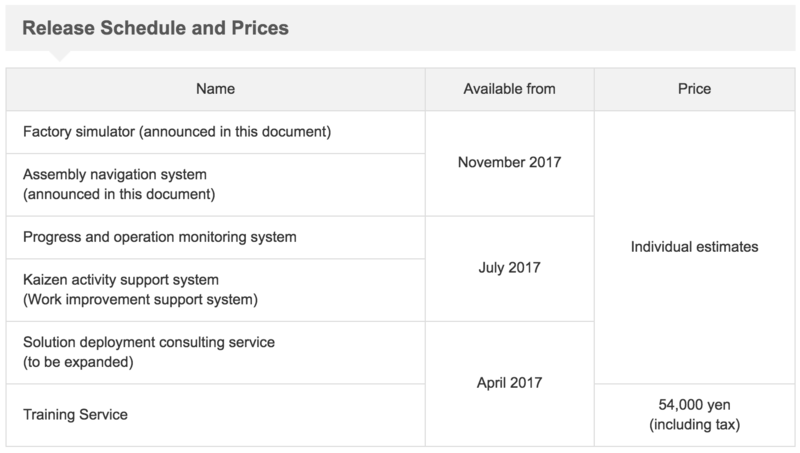 Examples of issues that cause the status of the production progress to change include delays, overplanning, and changes to items such as customer deadlines and the volume of orders. By applying and implementing these plans, the entire facility can be optimized. In a regular production scheduler, a BOM*6 must be created and the schedule must be managed. However, creating a BOM is difficult when a large number of different products are handled or when the parts to use are not specified. Even if a facility faces these issues, by using a factory simulator instead of a BOM, simple and accurate production schedules can be automatically generated by analyzing similar products by their category and using a basic unit for which the parts to be used do not need to be defined. This system automatically converts completed pieces of 3D CAD data created during the design phase into 3D work Instructions, which allows the manufacturing floors' workers to gain intuitive understanding of the information. In general, engineers create working drawings based on the 3D CAD data, and the manufacturing floors' workers follow those working drawings to perform their work. Manufacturing floors in which a large number of different products are handled need working drawings for each type of product, and have to re-create working drawings whenever the specifications change. This results in a lot of work for engineers. In addition, the manufacturing floors' workers have to take time to interpret and understand the technical working drawings created by engineers, which keeps productivity from being improved. 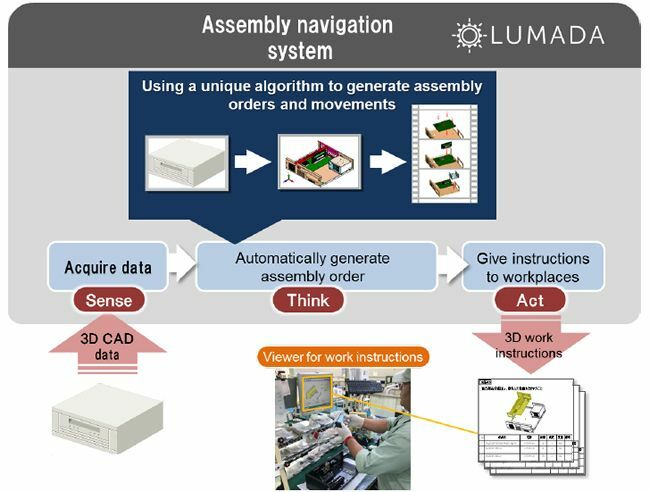 The assembly navigation system can improve productivity, reduce the work required by manufacturing floors' workers to interpret working drawings, and reduce the work required by engineers to create working drawings, by automatically generating 3D work instructions that are intuitively understandable. Specifically, this system incorporates the design and structure information from the completed piece of 3D CAD data, analyzes the order and movements used to disassemble the product by using a unique algorithm, automatically generates 3D work instructions to assemble the product in an appropriate order, and then provides the procedure to the manufacturing floors. As a result, manufacturing floors' workers can perform their tasks without needing to refer to more than one page, the time required to interpret the order for assembling a product from the working drawings is shortened, and variations in the work and the quality among manufacturing floors' workers are reduced. In addition, this system saves the time of engineers when creating work instructions. The 3D work instructions also indicate cautionary notes necessary for performing the tasks, such as notes on applying grease or on the number of torques to be tightened, which can help stabilize the quality of products. The IoT platform "Lumada", which is the basis of these systems, utilizes OSS*7 . "Lumada" also provides functions ranging from "Pentaho" (which enables the integration, visualization, and analysis of various types of data) to functions that are open, intelligent, composable, and secure. Moreover, these systems can quickly perform prototyping for the use of customer data and hypothesis verifications by employing the digital solution, cloud-type Collaborative Creation environment "Lumada Competency Center". Hitachi provides consulting services for manufacturing floors and offers one-stop service ranging from identifying the challenges faced by customers to the installing systems. From November, 2017, Hitachi will expand the range of consulting services applicable to the production design phase, and assist the implementation of modular designs*8 to improve productivity and the quality of the engineer's work.